We all know that the motorcycle culture brings out the guys with the beards and mustaches. 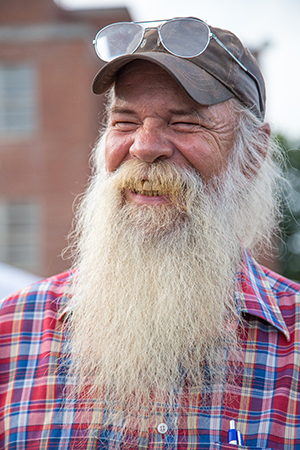 Think you’ve got a great beard or mustache? Are you going to be at the 79th Sturgis® Motorcycle Rally™? Well if you do and you are, we want you! Come on down to Harley-Davidson Rally Point on the legendary Sturgis Main Street Wednesday, August 7th. Registration starts at 5:00pm, the competition starts at 6:00pm. See how your beard compares to your buddies! Just $10 to register! Don’t even think about not coming. You owe it to yourself to be part of this outstanding competition. The beard appears as it grows naturally. The more natural the better! The mustache may not be highlighted. The beard may not be curled under at the bottom! No styling aids permitted. Full beard, any length, with distinct styled stache. Styling aids are permitted. The beard appears as it grows and left natural, the more natural the better and, of course, no styling aids in those beards. Mustache as it grows and left natural. The more natural the better. No closed curls. The mustache may be maintained but without styling aids. No styling aids permitted. Like to “do up” your stache? Then this category is for you! Styling aids are permitted. This is for the ladies. Show what the good lord neglected to give you and show us what could have been. Pick a theme for your beard or mustache – creativity is key. Judges will look at craftsmanship, creativity, and overall appearance when voting on the best Whiskerina competitors. YOU CAN SIGN UP AT THE RALLY! Styling aids include, for example, mustache/hair wax, hair spray, hair lacquer, hair gel, styling foam, etc. – Hair dye is absolutely prohibited in the natural categories. Natural beards shall be and shall look natural. The more natural the better. The beard also should be distinct from the head hair and not integrated with it. There will be prizes for the overall winner of each category. We always have the best prizes!